I found an almost perfect bag for carrying a small QRP transceiver, simple antenna, and accessories yesterday in our local Aldi grocery store. The bag (photo) is manufactured by “Adventure Essentials”, is described as an insulated lunch bag, is available in several color-schemes, and cost all of $3.99 plus sales tax. I purchased the grey-and-black version, product number 41991. The bag looks to be very rugged, is covered by a two-year warranty, and the tag even includes a toll-free telephone number for customer service. 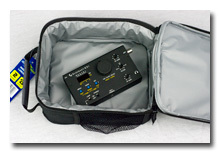 As can be seen in the photos, the bag is almost ideally sized for carrying any of the current crop of trail-friendly-radios such as the Elecraft KX1 or KX3, the Ten-Tec 40×0 two-band or 4040 four-band rigs, the Youkits HB-1A three-band or HB-1B four-band rigs, or the MFJ 92xx single-band rigs. If I didn’t already have a Pelican Case for my KX1 Mini Travel Kit, I could probably be very happy carrying the station in this insulated lunch bag! Standard disclaimer: I have no relationship with Aldi other than being a satisfied customer. This entry was posted in Grab And Go, Portable, QRP, QRP Radios and tagged Aldi, Cheap QRP Pack, HF Pack, Portable, Portable QRP, QRP Portable, QRP Station Pack. Bookmark the permalink. 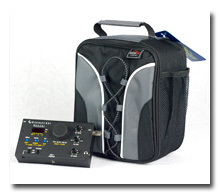 3 Responses to A Grocery Store Find — a Portable QRP Station Bag! You got to be kidding. They have Aldi in the US? I thought that was a German thing. That’s funny. My wife and I said the same thing when we went to Germany. Then we realized that ALDI is German! (Then we discovered Lidl, bu that’s another story). Hi hi! Nice find! Looks like enough room for a portable dipole too!